The Australian National Maritime Museum acknowledges the Gadigal people of the Eora nation as the traditional custodians of the bamal (earth) and badu (waters) on which we work. We also acknowledge all traditional custodians of the land and waters throughout Australia and pay our respects to them and their cultures, and to elders past and present. The words bamal and badu are spoken in the Sydney region’s Eora language. Supplied courtesy of the Metropolitan Local Aboriginal Land Council. The Museum would like to advise visitors that this content may contain the names and artwork, by deceased Aboriginal and Torres Strait Islander people. In celebration of NAIDOC Week 2018, explore some of Australia’s most renowned Aboriginal and Torres Strait Islander female artists, leading practitioners in their fields of weaving and shell stringing. Detail of ANMM Collection 00054382. Image: © Rosemary Gamajun Mamuniny/Copyright Agency, 2018. This year’s NAIDOC week theme is ‘Because of her, we can!’, which celebrates the invaluable contributions that Aboriginal and Torres Strait Islander women have made – and continue to make – to our communities, our families, our rich history and to our nation. For at least 65,000 years, Aboriginal and Torres Strait Islander women have carried our dreaming stories, songlines, languages and knowledge that have kept our culture strong and enriched us as the oldest continuing culture on the planet. A new exhibition, Unbroken Lines of Resilience: feathers, fibre, shells, brings together some of Australia’s most renowned Aboriginal and Torres Strait Islander female artists, leading practitioners in their fields of weaving and shell stringing. Their innovative works highlight the unbroken practices of our First Nations women and their deep cultural connections and knowledge systems. These practices include harvesting and processing organic and contemporary fibres, feathers and shells to create intricate bodywear for adornment. 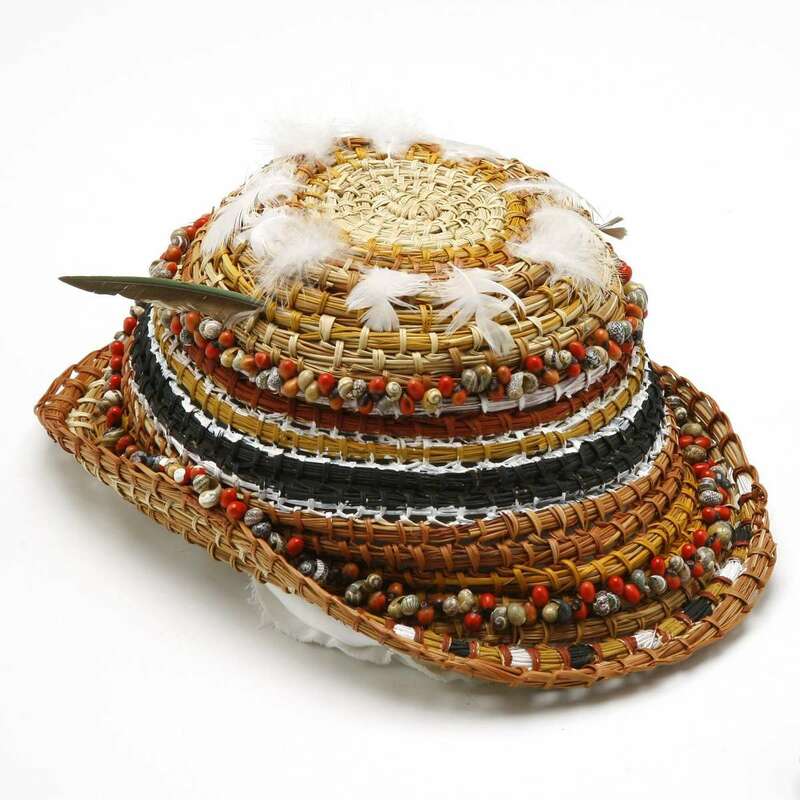 Hat woven from natural fibres with strings of small shells, seeds and feathers with painted decoration. ANMM Collection 00040541. © Mavis Galikali Warrngilna Ganambarr. Galiwin’ku is a community of the Yolŋu Aboriginal people and the only town on Elcho Island, some 550 kilometres north-east of Darwin. The community boasts a thriving arts centre, Elcho Island Arts, which services more than 200 Yolŋu artists who create Yolŋu art and designs that are direct inheritances from ancient times – and this creative island community that is making its mark on the worlds of art and fashion. The artforms and ceremonies passed on to today’s Yolŋu people express direct links to their significant creation sites and ancestors. The arts centre has earned a strong reputation for the quality of weavings, paintings, and carvings informed by these ancestral histories. Artists pride themselves on originality of design and knowledge of traditional bush materials, including natural earth pigments, which are used in both traditional and contemporary artforms. 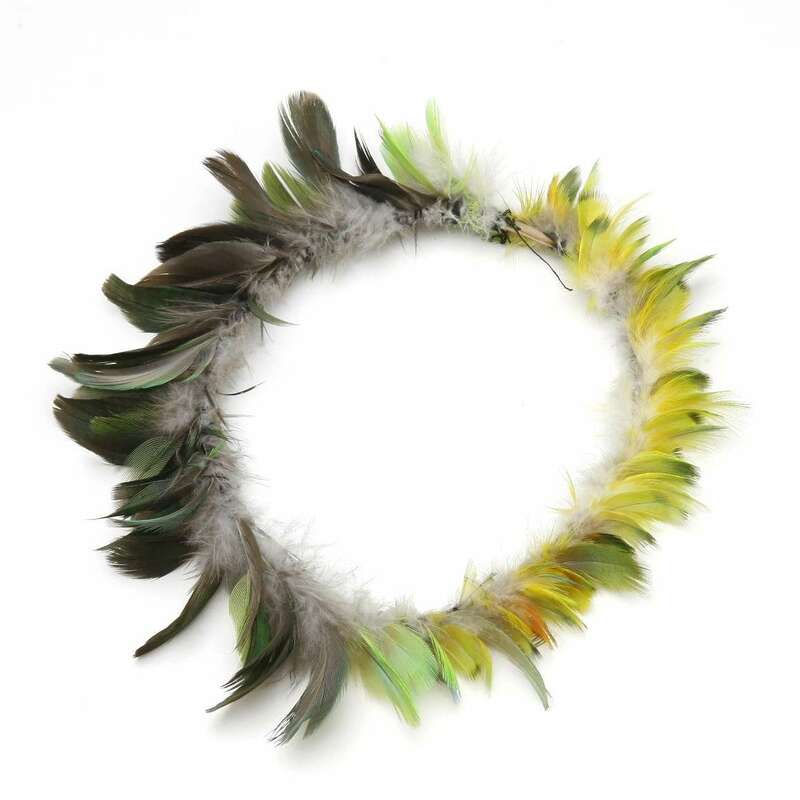 Armband of coiled plant fibres decorated with feathers, made by Mavis Warrngilna Ganambarr. ANMM Collection 00040542. © Mavis Galikali Warrngilna Ganambarr. The arts centre has been community-operated since 1992, and exists primarily to support Yolŋu artists in sharing their culture and deriving income from their art making. The arts centre assists in the production of artwork as well as the collection, promotion and distribution of high-quality Yolŋu art and design to a range of markets in Australia and overseas. A number of women who work out of the Elcho Island arts centre are starting to make their mark on the contemporary art scene, bringing their traditional weaving techniques into a new millennium. 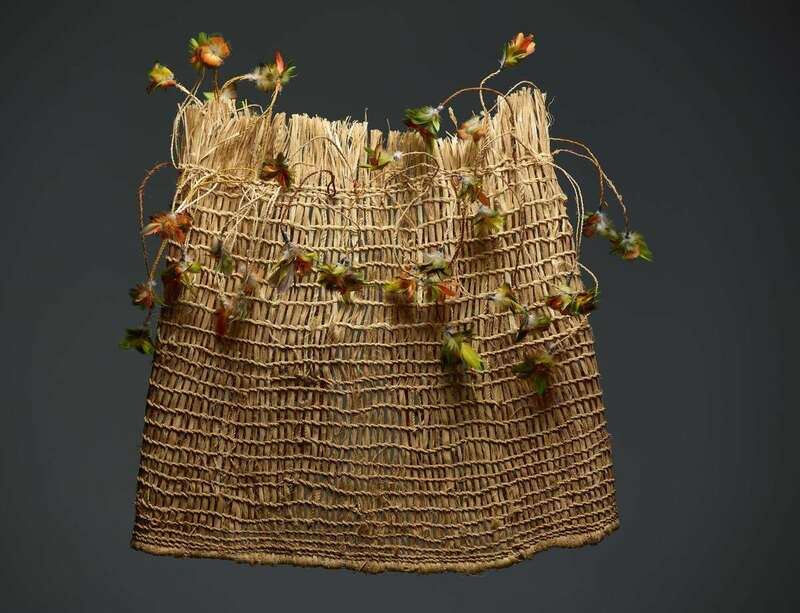 For centuries the Yolŋu women of Elcho Island have used the local pandanus plant and grasses to weave everyday objects such as baskets and fishing nets. They are now transforming these skills with artists such as Rosemary Gamajun Manuniny and Mavis Warrngilna Ganambarr. Rosemary Gamajun Manuniny is a Yolŋu woman from Galiwin’ku (Elcho Island) Northern Territory. She learnt the art of fibre work as a young woman from her mother’s mother, Leti Dhamarrandji, her mother, Dhananydjil Bukulatjpi, and father Gaykupa Gurruwiwi. 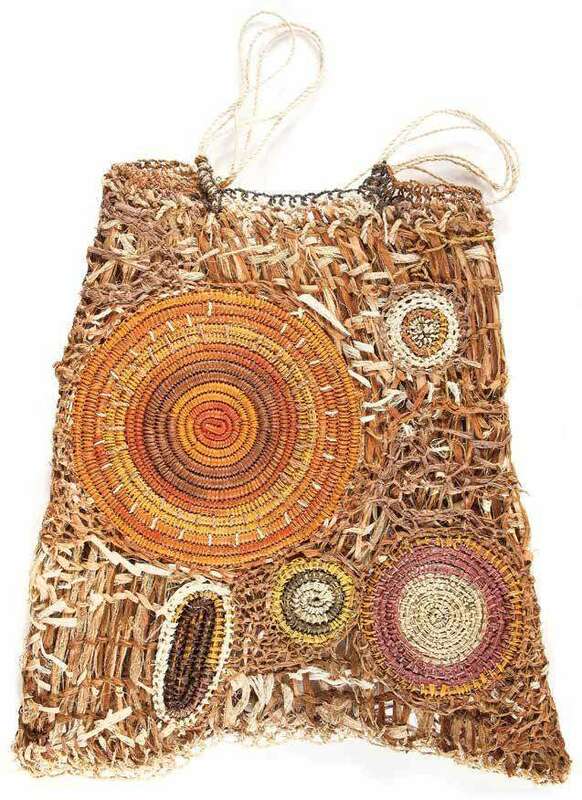 Mamuniny has exhibited extensively throughout Australia including Art on a string, which toured Australia in 2002-2003 including Banumbirr Elcho Island and Bandigan Morning Star Collection Australian National Maritime Museum, Sydney and Museum Victoria, Melbourne. Mamuniny produces a range of work made from Pandanas and Kurrajong string such as baskets and mats, however, she is best known for her work with feathers. Her skills are in demand to assist in the making of ceremonial Pul Pu, which adorn the strings of Morning Star Poles. Many of the Morning Star poles made at Galiwin’ku are created by her brothers. Similar Pul Pul are incorporated in her necklaces which use shark vertebrae, Neritini shells and feathers from the body of the Red-collared Lorikeet, (Trichoglossus Rubritorquis). This woven skirt was produced for the inaugural Australian Indigenous Fashion Week (AIFW) in 2014. 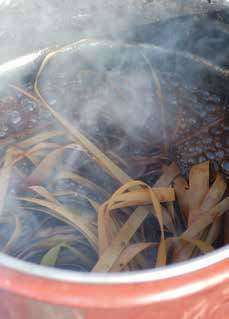 Kurrajong bush string, pandanus, feathers and natural dyes. ANMM Collection 00054382. Image: © Rosemary Gamajun Mamuniny/Copyright Agency, 2018. Her woven fibre and feathered skirt demonstrates the use of traditional knowledge and techniques of weaving being used in a contemporary context bringing them into a new light and allowing the artist the opportunity to translate her techniques into a new forms, such as a woven skirt which was produced for the inaugural Australian Indigenous Fashion Week (AIFW) in 2014. Mavis Ganambarr is one of Australia’s leading fibre artists. Born at Matamata outstation on the mainland, on the west coast of Arnhem Bay, she now lives at Galiwin’ku with her husband and children. Mavis is the daughter of clan leader Mowarra (c 1917–2005). He, too, was a renowned artist, whose works are among the museum’s collection of Saltwater Barks. Mowarra showed Mavis how to use ochre to paint highlights in her work, and later, when he was staying with her during his final illness, he suggested that she begin making ‘soft sculptures’ – three-dimensional creations in fibre, such as hats, pendants, animals and human figurines. Mavis credits her late father for her inspiration, and after his passing she spent several years on her homelands experimenting with innovative techniques, all stemming from traditional practice. Mavis Ganambarr working with pandanus leaves. Image: Koskela. 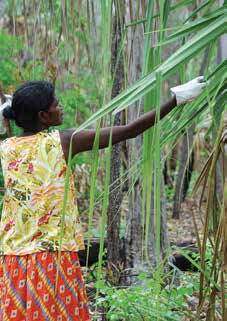 Mavis harvesting prickly pandanus leaves. The leaves must then be split before they are dyed and woven. Image: Koskela. 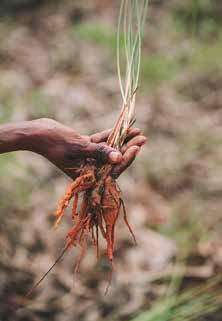 Mavis Ganambarr with roots from which she extracts her preferred deep yellow dye. Image courtesy Koskela. Pandanus leaves being dyed outdoors. Image: Koskela. Mavis was still a small child when she was introduced to weaving by her grandmother, Djuluka, and her female relatives at Matamata. By the time she had finished school, she was an accomplished weaver, having gained knowledge of collecting plants and natural dyes, preparing bark fibre strips and weaving dilly bags in the bush, the same way her grandmother and those before her did. Mavis prefers to work with a deep yellow natural dye, as the colour refers to that of the earth. Yolŋu society also has strong belief systems, including the balancing of nature, landscape and the human presence within them. Colours have clan associations that can be expressed and seen in the stories made through art. Mavis has also explored texturising colours throughout her work by using feathers that are given to her, along with seeds or shells. She has spent years experimenting and creating new styles of weaving and wearable art, and has worked collaboratively over the past two decades with other artists, curators and designers, including Dr Louise Hamby, jeweller Alice Whish and Sasha Titchkosky of Sydney-based design company Koskela. 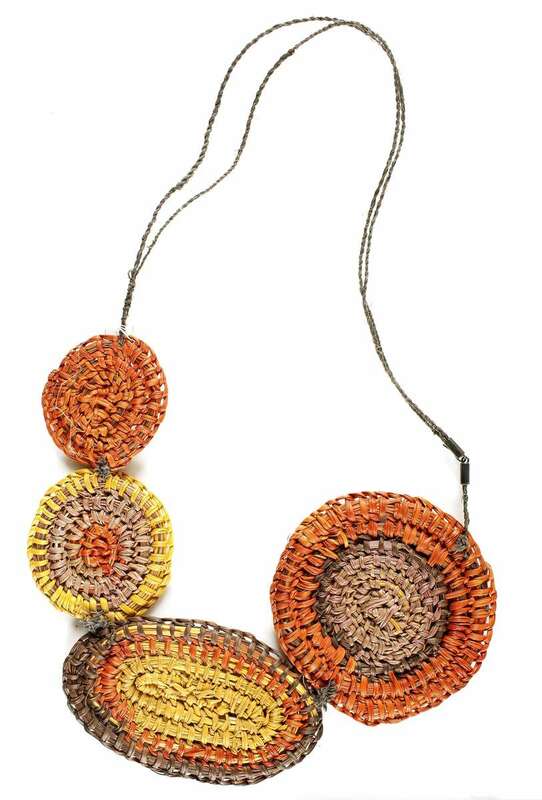 Necklace woven from pandanus and bush string with natural dyes, made by Mavis Warrngilna Ganambarr for Australian Indigenous Fashion Week (AIFW) 2014. ANMM Collection 00054381. © Mavis Galikali Warrngilna Ganambarr. Designed to complement the necklace is this top of woven pandanus and kurrajong fibres with natural dyes, which also featured on the catwalk at AIFW 2014. ANMM Collection 00054380. © Mavis Galikali Warrngilna Ganambarr. Mavis has exhibited work across Australia, including in the 16th Tamworth Fibre Textile Biennial, at Sydney’s Powerhouse Museum, in the 29th Telstra National Aboriginal and Torres Strait Islander Art Awards in Darwin, and at the Museum and Art Gallery of the Northern Territory. Her solo exhibition Gunga Djama Mirr (Pandanus Work) was held at the Bandigan Art and Crafts Gallery Sydney, 2001. Her works have been acquired by the National Gallery of Victoria and are included in the Kerry Stokes Collection. In February 2010 Mavis participated in the Yuta Badayala (New Light) project and exhibition, product of a joint project with Koskela. 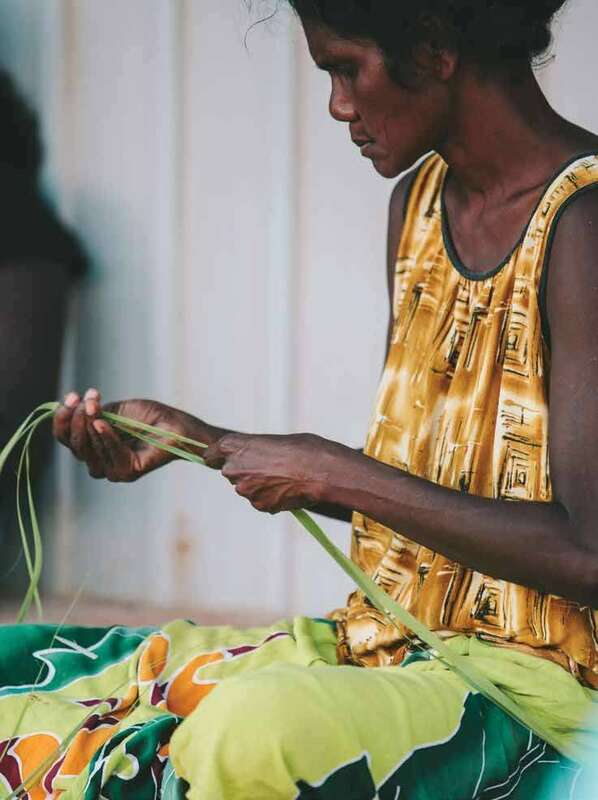 Its aim was to give Yolŋu women the opportunity to transfer their traditional weaving techniques onto new forms so that long-held cultural practices and art-making skills could be seen in a new light. The project also aims to develop new markets for Indigenous fibre art. The project provided Mavis with the opportunity to translate her traditional techniques onto a new form, and offered a long-term sustainable business opportunity for Yolŋu women through Elcho Island Arts. Bapa Shepie [a missionary] brought me to Galiwin’ku when I was nine years old so I could go to school. I was taught fibre art by my grandmother Djuluka … I have been continually creating weavings and wearable art since then. I am very proud of what my grandmother taught me to do, but now I am making different, new styles of my own ideas. I teach my children and one day they will teach their children. In this way we will keep our culture strong. Unbroken Lines of Resilience: feathers, fibre, shells is on now. The museum wishes to thank Elcho Island Arts and Koskela for their assistance with this article. Helen Anu is a Koey-Buway, Samu Augud (Cassowary) and Sui-Baidham (Black-winged Stilt and Shark) Clan Woman of the Zei Gub (South West Winds) from the Top Western cluster of the Torres Strait Islands. Helen has worked as a cultural practitioner in the Aboriginal and Torres Strait Islander Arts, Culture and Media Sector for 25 years, and currently works in Indigenous Programs at the Australian National Maritime Museum. She assists with the delivery of Indigenous-specific projects, cultural outreach, engagement and exhibitions, including highlighting the narrative of new and existing works held within the museum’s Indigenous collections, and supporting the transmission of traditional and contemporary Saltwater and Freshwater stories.